The September issue of Jazziz magazine includes a page-and-a-half article by Bill Milkowski about Zawinul and Vienna Nights. A post by Ian Ingram on the Zawinul Fans Mailing List tipped me off that BBC4 will air an hour-long program on September 16 about the life and work of Joe Zawinul. 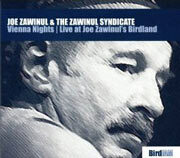 It includes Joe demonstrating his keyboards, and concert footage of the Zawinul Syndicate. It is planned that the program will be released by newly formed Calliope Media in conjunction with BBC Worldwide. This past weekend the Zawinul Syndicate returned to Yoshi’s Jazz House after a six-year absence, and man, did they make up for lost time. They positively incinerated the place. I’m half tempted to drive up to Yoshi’s tonight just to make sure the club is still standing. As you might expect of someone that runs a Zawinul web site, I like Joe’s music a lot, though I try not to be a gushing fan about it. Well, I guess I’m going to have to gush for this report because these shows really knocked me out. I’ve seen the Zawinul Syndicate perform many times (and Weather Report, too, on numerous occasions), and these past four nights surely rank among the top. The band was simply on fire. The engagement started on Thursday night, and by all rights the band should have been tired. Having played a gig in Guadalajara, Mexico the night before, they were out of their hotels and on the road at five in the morning, with two sets to play at 8:00 and 10:00 that night. Travel problems delayed the arrival of equipment and the sound check. Nevertheless, they got after it from the git go, and blew the doors down in the second set of with a performance of “Badia/Boogie Woogie Waltz” that generated an intensity I’ve rarely witnessed. From there, the energy seemed to grow each night, climaxed by a stunning show Sunday to close out the run. Even the Yoshi’s regulars were awed. Linley Marthe. The guy is amazing. I’ve seen Joe play with Jaco, Richard Bona, Victor Bailey, Matthew Garrison, Gerald Veasley and Alphonso Johnson. Linley’s right up at the top of that list. He puts down a killer groove, he’s got amazing chops and stamina, and he and Joe have a great connection. As one Yoshi’s listener put it, “He’s the baddest bass player I’ve ever heard!” Indeed. Ironically, Joe says it was “by accident” that he originally got in touch with Linley. At the time, Etienne MBappe had pulled out of a tour and Joe arranged for Guy Akwa Nsangué to take his place. But last minute visa problems with Nsangué forced Joe to check around for another player, and a friend recommended Marthe. Joe tells me Linley is also an excellent pianist. I hope Joe’s paying him well! “Fast City.” They played this tune from Weather Report’s Night Passage album, and it was a showcase for Marthe. His solos were just insane. He coaxes music out of his instrument in every possible way. A tour de force performance. “Rooftops of Vienna.” The band usually played this to close out the first set, and it smoked every time. “Badia/Boogie Woogie Waltz.” This medley usually closed out the second set. As you know if you listened to Vienna Nights, Joe has reinvented “Badia” using all of the talents of his current musicians. This was another cooker. When they transitioned to “Boogie Woogie Waltz” percussionist Jorge Bezerra came out front with a conga drum. The energy that radiated off the bandstand was astonishing. Sabine Kabongo. Her performances of “Come Sunday” were beautiful, and it seemed particularly heartfelt on Sunday night as the audience responded and urged her on. Those of you in L.A., don’t be bashful about letting her know that you appreciate what she’s doing. It was interesting to see how much Joe’s intro to “Come Sunday” varied with each performance, as did all of the tunes each night. “Cafe Andalusia.” As much as I liked “Come Sunday,” I think I enjoyed Sabine’s performance on this tune even more. It really shows off her ability to use her voice as a musical instrument. The rhythm section. Nathaniel Townsley III, Jorge Bezerra, Alegre Corréa and Marthe. Superb. Townsley has played off and on with Joe for three years or so, and he’s really a remarkable drummer. This group of musicians has been touring with Joe all summer, and it showed. They take on the furious tempos that Joe loves, as well as the instant stops and starts. One of my favorite moments was at the end of Thursday’s show when, after introducing the band, Joe said he didn’t know what they would play next, but he’d figure it out by the time he got back behind the keyboards. Whereupon he counted off the final number and the band went from a dead stop to instant full throttle. Cool. It also appeared that they really enjoyed playing together, as there were a lot of smiles on the bandstand. Zawinul. He sounded as good as ever. I was asked if Joe has any plans to slow down anytime soon. Not that I’ve heard. Those of us in the San Francisco Bay Area are lucky to have a venue like Yoshi’s, as well as the Kuumbwa Jazz Center in Santa Cruz, where the Syndicate played a year and a half ago. These smaller clubs afford us the opportunity to see the band up close, and observe Joe conducting the band from behind his keyboards. These shows at Yoshi’s were exhilerating. Nobody else is doing what this band is doing. For those of you in Southern California, catching the Syndicate at Catalina’s this week is a must. Kolkata Newsline has published a two-part interview of long-time Syndicate guitarist Amit Chatterjee. Amit was born in Kolkata (Calcutta), India and lived there until he moved to the United States with his family at the age of 12. Read Amit Chatterjee Interview Part One. Read Amit Chatterjee Interview Part Two. A couple of new Zawinul interviews have been published as part of the promotion for the Zawinul Syndicate’s North American shows. As of January 2007, the NewCity Chicago Zawinul Article is still online. The Lansing State Journal article on the Detroit International Jazz Festival is not.